What is Mangalitza meat? A very good question! 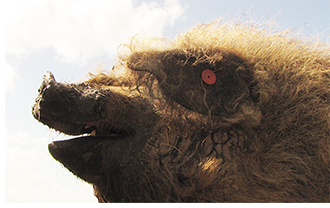 Mangalitza is a very old breed of pig. It is the cutest wooly pig to look at, but it tastes nothing like pork. It is a dark meat, marbled, juicy and very flavoursome. Mangalitza is a slow growing pig and is not ready for slaughter until it is at least 18 months of age, during which time it not only gains its marbling akin to wagyu, it builds up a fantastic flavour. 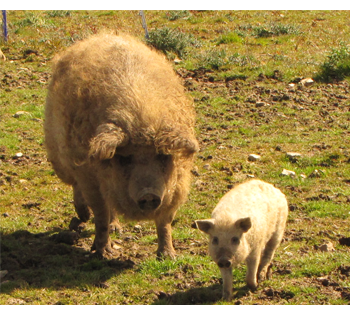 Mangalitza were created in 1830's by Archduke Joseph Anton Johann of the Austro-Hungarian Empire. Created for the Habsberg Royal Family by crossbreeding various native Hungarian breeds from Szalonta and Bakony with the Serbian Šumadija breed, which were given as a gift from Prince Miloš Obrenović. Originally there were 5 colours of Mangalitza, each having different carcass confirmation. The pigs were raised for their lard and the Habsberg Royalty used it for everything. The fat and the meat of the Mangalitza were of such high quality that by the end of the century it had become extremely prized across Europe by Royalty and the aristocracy. It was even floated on the Vienna stock exchange for many years. As animal husbandry practices changed after World War II, coupled with the need for faster-maturing pigs, Mangalitza numbers declined so dramatically that in 1980's, this once highly-prized, supreme Royal delicacy, was on the brink of extinction. Thanks to specialist breeding programmes and the recent resurgence in demand for this high-quality meat and fat, 3 colours of the Mangalitza have, for now, been saved. These fabulous pigs are so different from your everyday pig. For starters they have a thick, curly, wooly coat which helps them withstand temperatures as low as -30°C. In hot summer months they moult and lose their wool like hair but their black skin helps them combat sunstroke and they adore muddy wallows to help them keep cool. 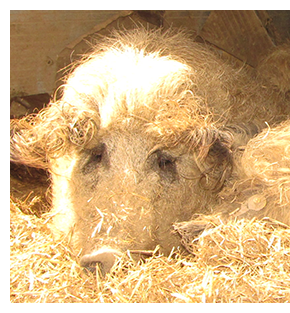 Mangalitza can live up to 25 years and can be a very placid, docile breed in the right hands and if fed correctly. But their maternal instinct is second to none and coming between mother and baby can be very dangerous, as Julian our vet was to discover! Content copyright Lisa Hodgson © Lisa Hodgson/Otterburn Mangalitza 2018, unless otherwise stated. All rights reserved.